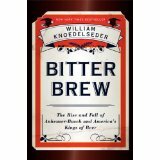 William Knoedelseder’s “Bitter Brew” offers a sometimes fascinating history of America’s most famous beer-makers. I DECIDED TO REVIEW William Knoedelseder’s Bitter Brew: The Rise and Fall of Anheuser-Busch and America’s Kings of Beer because of my loyalty to Bud Light Lime. I love Bud Light Lime, and I wanted to know where it came from. But because Bud Light Lime probably isn’t a natural beer of choice for the LARB crowd, I thought I’d take a second to explain its excellence. Bud Light Lime does two things: it allows me to shed the burden of sophistication, and it restores beer to what it once was, when I was young — a tart nectar that makes me happy. To speak to the second point (I’ll get to the first later): With Bud Light Lime, I never find myself slumping over the bar, turning every 30 seconds to watch the door in the hope that some imagined friend will walk inside and pick me up and fix all my problems. With Bud Light Lime, that kind of attitude isn’t even possible. Because it’s hard to be morose while drinking a sweetened, lime-flavored beer, yes, but also because being morose requires a self-seriousness that Bud Light Lime completely forbids. And, to speak to the skeptics in the audience: yes, they do serve Bud Light Lime in bars. Mulligan’s in Valencia has it, but they won’t give you the happy hour price that applies to regular, unflavored Bud Light and Budweiser. If you order six of them at the Chincoteague Inn in Virginia they’ll serve them to you in a cardboard six-pack container. And if you get one at the Stampede in Temecula, where not just the American and the Californian but also the Texan flag hangs from the rafters, you can drink it alongside skinny white guys with Confederate flags folded just so and hanging from their jeans’ back pockets, which is a fashion I never even came close to seeing while living in Georgia, where my BLL drinking got its start. I first tried Bud Light Lime in 2010, two years after it hit the market, at a shallow and warm-watered man-made reservoir beside a coal plant while watching TV under a tarp, beside an RV, in an RV park. We drank it under the tarp, and then we drank it on a boat while blasting music. Then the guy who owned the RV, a potbellied financial advisor from Tampa named Patrick, gave me a 12-pack for the road, and after that, I never looked back. Now, I get text messages from multiple friends when they drink the stuff, and I have participated in the invention of multiple BLL variations: Double Down (BLL with a slice of lime), Picante (BLL with a massive amount of Tabasco) and Loco (BLL with Mountain Dew). [It was the year 2008 and Anheuser-Busch] department heads were scrambling to find more then $400 million in spending cuts just as the company was preparing to drop a bundle on the rollout of a high-profile new product, Bud Light Lime.